Jolly Elsa arrived at NICI-Mania! Jolly Elsa is indeed a jolly NICI sheep. Elsa totally mesmerized us with her jubilant look which is refreshing and vivifying. Jolly Elsa is also a playful sheep, she's already so mirthful playing with our smaller NICI soft toys upon her arrival! Elsa is a very unique NICI sheep, let's go through some of her special features! Jolly Elsa special feature 1: Cute butterfly on her head! Jolly Elsa special feature 2: Lovely pink ears flipping outwards! Jolly Elsa special feature 3: Petite pink skirt slightly covering her rabbit like sheep tail! Jolly Elsa special feature 4: A pink belly button beneath her petite skirt! Jolly Elsa special feature 5: Arms bending at an angle, different from all NICI Jolly Mah sheep so far. Jolly Elsa is smaller sized than other similar 35cm NICI plush. Her whole body is thinner than Jolly Liselle. 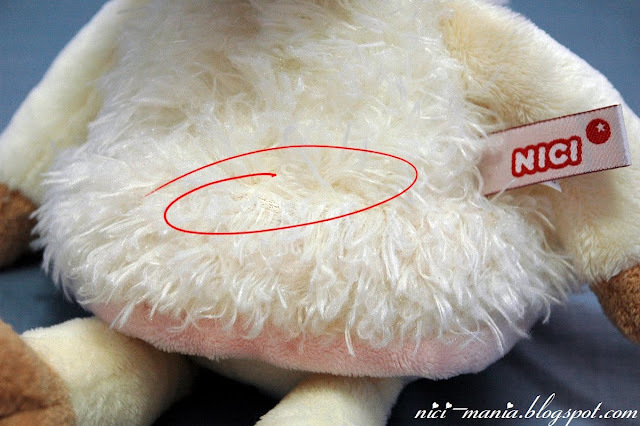 The overall plush on her body is also not as thick as others, we'll show you an in depth picture of Jolly Elsa's plush below..
NICI Germany did it again, the quality of their soft toys are still not getting better. Look at the patch of baldness circled in red. Thats the same thing which happened to last year's winter series Jolly Svenja. We were really lucky that this baldness is considered mild, we have seen another Jolly Elsa at CNS Centrepoint with much worse bald issues. When will NICI really look into their manufacturing plant in China regarding the quality control of recent soft toys.. Since Jolly Elsa's arrival at NICI-Mania, she has been the only NICI sheep to ever come close to dethroning Jolly Rosa from our cutest sheep crown. Maybe its her pink color ears or the cute butterfly on her head, there's something special about Jolly Elsa, just like Rosa. After so much we said about Jolly Elsa, have you wondered what happened to Gustav? 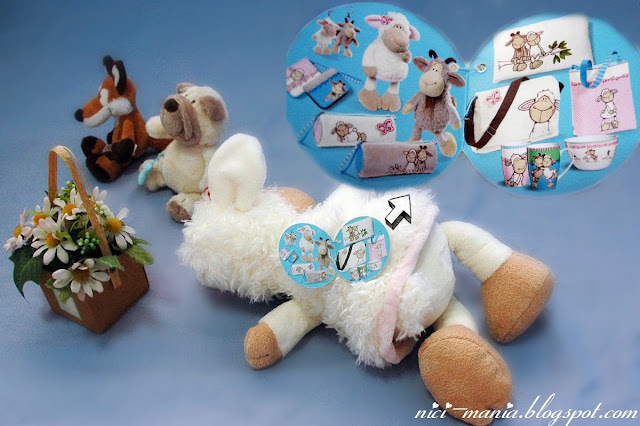 Gustav is also a very special NICI sheep, its the first time a mountain goat plush appeared in NICI. Gustav will be joining Elsa soon we promise! For now, Elsa is gonna take pictures with other NICI soft toys..
a guitar!! While NICI pug and Frederic Fox joined in with the photo session, Jolly Liselle was so busy trying to find a nice position to pose with the guitar behind everyone. There goes busy Jolly Liselle again..
And finally Liselle got a nice pose she's satisfied with! Jolly Elsa has another special feature we forgot to mention: Pink nostrils just like Jolly Rosa! And the queen of NICI-Mania looks down upon her contender Jolly Elsa who is the newest threat to her throne. Here are some Elsa & Gustav merchandise..the pillow and mugs are extremely cute! We'd love to get the Jolly Elsa nylon shopping bag! 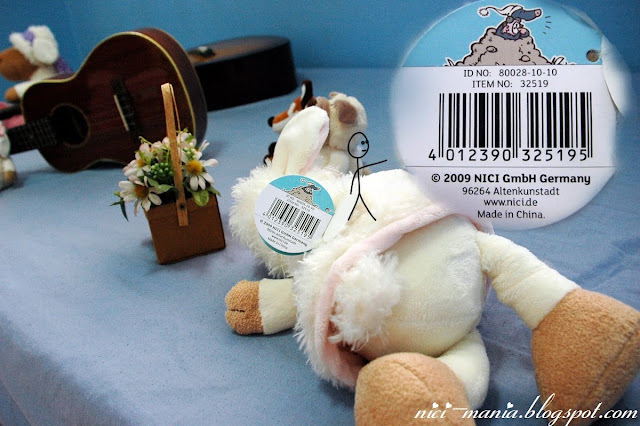 Jolly Elsa's NICI card has something interesting on it..anyone knows what has this interesting animal holding an alarm clock got to do with Jolly Elsa & Gustav? If you wanna get Jolly Elsa, we highly recommend the 35cm size. It was love at first sight with Jolly Elsa when we saw her at CNS Plaza Singapura. We have seen them all and she is the best looking 35cm Jolly Elsa in Singapore. Surprisingly, all the 50cm Jolly Elsa did not look cute. 25cm Elsa had thin and disoriented face. 80cm and 120cm Jolly Elsa on the other hand are awesomely cute! How pretty!!! It's beautiful,of 35cm is very cute, but obviously the bigger tend to be more beautiful. That funny Jolly Liselle with the guitar hehe. We'll wait for Gustav to appear here. Hehe..
Elsa is so pretty! We love her too. You already know that we collect 15 cm Nicis, and in this size she has not any baldness. Specially made that butterfly effect for Jolly Elsa because of her butterfly. Heartly welcome Elsa. We love the photos. It`s a felicitous presentation of your charming and bright new sheep girl. And how nice are the sheep together trying to be the best models haha. btw, Gustav is named Marc Jacobs~! I love the way you let your sheep live. That Liselle that keeps trying, trying, trying (busy busy) to mount the guitar, trying to get comfortable, wonderfully photographed! Also I enjoy your critique, you certainly know your NICI-stuff and are not afraid to be critical of the manufacturing.